IBM says it will build commercially available quantum computing systems accessed through its cloud platform, but D-Wave has a claimed quantum computer 400 times bigger. Quantum computing has the promise of outperforming today's computers to an extraordinary degree at certain tasks such as factoring very large numbers. It uses sequences of quantum bits – qubits – which, in quantum mechanics, can have a binary 1 or 0 value (Quantum basis state) or summation of both or the values in between; having a superposition of both values. A qubit can thus represent 1, a 0 or any quantum superposition of these two basis states. Other quantum mechanical phenomena such as entanglement are also used in quantum computing. We understand that a quantum computer with n qubits can be in an arbitrary superposition of up to 2n different states simultaneously. Big Blue has a five-qubit quantum computer ready for use now. It intends to build commercial IBM Q systems with ~50 qubits in the next few years to demonstrate capabilities beyond today's classical systems, and plans to collaborate with key industry partners to develop applications that exploit the quantum speedup of the systems. One of the first and most promising applications for quantum computing in IBM's view will be in the area of chemistry. It states that: "Even for simple molecules like caffeine, the number of quantum states in the molecule can be astoundingly large – so large that all the conventional computing memory and processing power scientists could ever build could not handle the problem... The goal will be to scale to even more complex molecules and try to predict chemical properties with higher precision than possible with classical computers." Potential quantum computing areas, which cannot be effectively addressed with existing (classical) computing include molecular and chemical interactions, optimal pathing in supply chains, and financial data and risk modelling, as well as enhanced security. IBM Systems SVP Tom Rosamilla said: "We envision IBM Q systems working in concert with our portfolio of classical high-performance systems to address problems that are currently unsolvable, but hold tremendous untapped value." 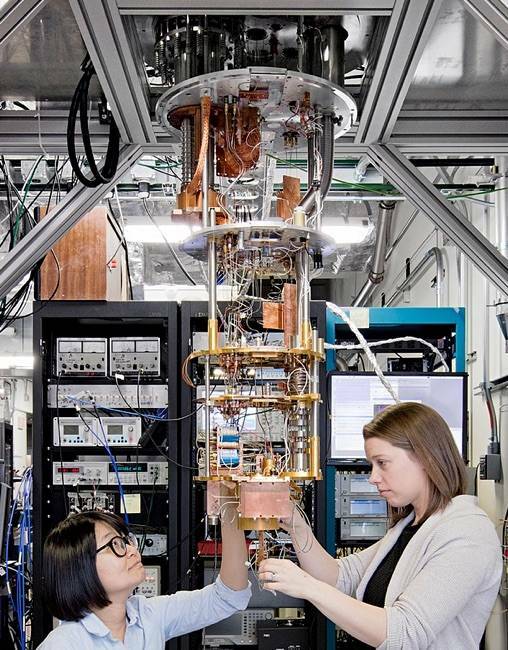 IBM has announced its Quantum Experience website and facility in the IBM cloud so remote users can connect to and try out its quantum computer. We're informed that, since its launch less than a year ago, about 40,000 users have run over 275,000 experiments on the Quantum Experience. IBM's Quantum API specs are available on GitHub and is providing simple scripts to demonstrate how the API functions. 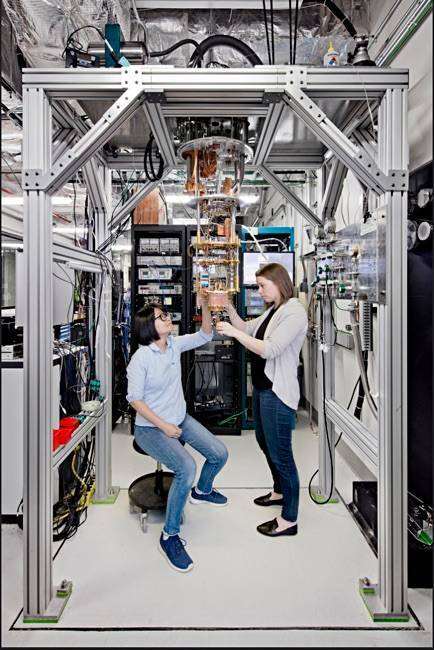 IBM quantum computing scientists Hanhee Paik (left) and Sarah Sheldon (right) examine the hardware inside an open dilution fridge at the IBM Q Lab at IBM's T J Watson Research Center in Yorktown, NY. Click image for a closer look at the hardware. In May last year researchers built a quantum-computing processor featuring five superconducting qubits, and made it accessible over the public cloud. At the time Arvind Krishna, an IBM Research SVP and director, said: "This moment represents the birth of quantum cloud computing." El Reg thought this was quantum computing marketing hype, noting: "IBM reckons 50 qubits are needed to top the fastest known supercomputers of today." Krishna now reckons: "Following Watson and Blockchain, we believe that quantum computing will provide the next powerful set of services delivered via the IBM Cloud platform, and promises to be the next major technology that has the potential to drive a new era of innovation across industries." What we are seeing here is the intersection of IBM's deep and eminently respectable scientific research and its formidable marketing machine, a combination that makes HPE Labs look like a child playing with Lego. A key question is whether IBM's researchers and engineers can build a working 50-qubit system in the next few years, which we take to mean by 2022. Also, will it be worthwhile in out-performing classical computers? It had been thought that working, useful quantum computers were decades away. Maybe not, but, when marketing operations like Big Blue's get involved you see so much creamy fluff around the topic you end up not knowing which way is up. Google has a planned 50-qubit system and has built a nine-qubit system with a superconducting circuit. D-Wave says it has a 2,000-qubit quantum computer plus a qbsolv compiler available on GitHub for its quantum computer. There is some dispute whether D-Wave's systems are real quantum computers or not. Notwithstanding that Google and NASA have bought one and are pleased with it. The D-Wave website has lots of gee-whizzery about its 2,000-qubit system, such as: "A lattice of 2,000 tiny superconducting devices, known as qubits, is chilled close to absolute zero." Microsoft researchers say we could see a real quantum computer by 2025. IBM's five-qubitter seems rather small beer compared to a 2,000-qubit D-Wave system. You'd think that if D-Wave was up to 2,000 qubits then IBM's boffins wouldn't be messing around with systems 400 times smaller. But this is quantum mechanics where two things can be true at once – so what the heck do we know? *Thanks to Chris Woodford for the flute example.